Sam Barden reports that the first glass blank is ready for transformation into the front lens of the 4MOST wide field corrector. 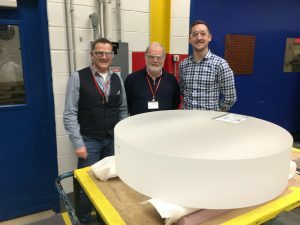 This piece of fused silica, produced by Corning, is just under 1 meter in diameter, about 200 mm thick and weighs a third of a tonne. It is a high precision glass element, meaning that the index of refraction is very uniform throughout the body in order to allow consistent optical performance. The 4MOST wide field corrector is a set of 6 optical lenses that “fine tune” the optical performance of the VISTA telescope in order to provide the necessary field of view and image quality required for 4MOST to meet its objectives. This glass blank will now be shipped from Corning to KiwiStar Optics in New Zealand where it will start the 18 month transformation from the cylindrical blank into the finished optical element. Funding for this has been provided by the BMBF.